Flashback sold this Newcomb College Pottery vase with a swamp scene in blue glaze, matte finish. The bottom is marked NG1, 250 indicating 1923. There are also the Newcomb College and the artist mark - Henrietta Bailey. The vase is 8 ¼ inches tall and 4 inches at the widest point. The opening is 2 inches and the bottom is 2 ½ inches wide. 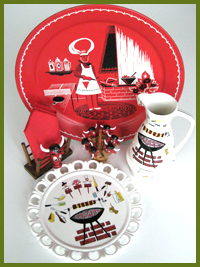 Flashback has a wide range of vintage and retro house ware items including every day items and designer pieces. We strive for the best condition possible considering the age of many of the items. With Memphis in May and the Bar-B-Que contest, it is natural that we seek out related items. 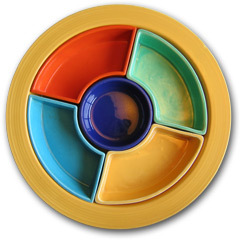 Metal Bar-B-Que trays with fifties graphic are a regular find. Napkin holders and toothpick grill markers add flare to the presentation. Milk glass serving plate and ceramic sauce warmer sport a grilling theme to set a festive mood. Vintage barware has always had a flare, indicating the importance of setting a festive mood in social situations. Drinking glasses, ice buckets, cocktail shakers, stirrers, recipe books, bottle openers, napkins, and ice crushers are regular inventory staples. 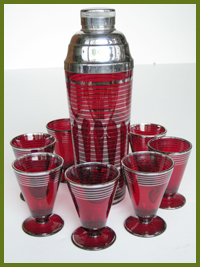 On occasion, we are fortunate to find a matching set such as ruby red cocktail shaker and glasses. Western items have always been a part of the Flashback inventory. 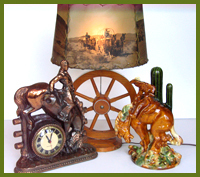 Western lamps with photographic image shades on a wagon wheel base are a classic. Cast pot metal clocks with a western theme are timeless. Ceramic figures with a western theme are a fun accent item.